"Your wealth and your children are only a trial, while with Allah there is a tremendous reward." In general, the priorities of many parents today for their children include wealth, material comforts, a good education, a good job and to have a happy marriage. There is nothing wrong with accepting the wealth and comfort of what Allah has granted us, but we must remember why we are here. Despite the difficulties raising children, one must keep in mind that as with wealth, they are a treasure from Allah and the way you raise them, they could lead to your success or failure in the hereafter. One cannot underestimate the importance of instilling strong Eman in our children. Strong belief in Allah will deter them from wrongdoings. Natural instinct often tells us when something is not right. Knowledge determines right from wrong and in how to react to problems gives children confidence to teach others and defend themselves. We should never presume that our children will learn from the good examples of their parents only. In the modern world, parents only spend a limited amount of time with their children; society, other Muslims and the general non-Muslim community all instil values and their ideologies into our children, influencing their behaviour Eg. TV, schools, friends, neighbours. A welleducated parent is better able to guide their children. 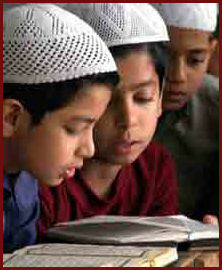 It is so important for parents to make time to teach our children quran, salaat and give them knowledge of our deen. We need instil pride in our glorious history and give our children confidence from the historical examples to learn from. Prophets and their family give us rich examples to follow. The modern day void of historical knowledge leads to our kids following modern day heroes, teaching children all the wrong principles and values. Children now days will face many more hardships than ever before with such a changing world. How can we expect them to defend and follow Islam if they don’t really understand the how’s and why’s? Consistency is the key with everything. Children love to know what is expected of them and what they can and cannot do. An important part of discipline includes setting down the ground rules that the parents feel comfortable with. It is so much easier to accept and learn from being corrected when you are told why things should have been handled a different way and given examples of how to act. Through being patient, showing compassion and mercy we hope our children will treat us the same way when we become old and rely on them to look after us. There are many ways to raise children to love and fear Allah, thus learning the differences between right and wrong. One of my favourites is lots and lots of praise and encouragement for good behaviour, making them self-confident and happy to continue to behave well. This has to be reinforced by parents giving warnings for bad behaviour and then placing the child in an isolated spot to think about what they have done for a short period of time (2 minutes for every year of the child) and then apologize to you for what they did wrong. This calmly shows our blessed children without yelling or hitting, what is acceptable behaviour, the difference between right and wrong and respect & reasoning are the key to solving misunderstandings. Remember, children love attention and affection shown in a positive way.